Nearly three years ago, we reviewed Grado's flagship model, the GS1000. We hardly stinted with praise, describing it as possibly 'the finest electricity-to-sound transducer in the world'. But three years is a long time in audio – long enough for two particular things to happen. First, Grado informed us that a new version of the GS1000 was available, sporting the suffix 'i' for 'improved'. Second, Sennheiser weighed in recently with the HD800, a direct competitor at a similar price, which we wrote about in terms suggesting it might be a match, or more, for the GS1000. That gives this new model two marks by which to be judged – its predecessor and the newcomer from Sennheiser. But what has Grado actually done to justify the 'improved' tag? All that's obvious externally is a thicker (and slightly shorter) cable. The company is invariably coy with technical details, but its website does give a few pointers. For a start, the new cable has eight conductors, made of ultra-high purity, long-crystal copper, the same material as is used for the voice coils. The dynamic drive unit is upgraded, while the wooden surround uses a new type of wood and all the tweaks are claimed to give better control and stability of the treble and bass. The experience of wearing these headphones is exactly the same as with the original GS1000, dominated by the bizarre-looking but effective foam earcups which, attached to a moderately springy headband, keep the drive units stable on the ears with minimal pressure on any sensitive bits of the head. No headphone is perfectly comfortable over a long period, but these do better than most: the headband can become a little uncomfortable on the top of the head after a while, but it's a simple matter to move it a centimetre or two. Sound seems consistent every time the headphones are put on – some are very fussy about exact placement but these are quite forgiving. There's no doubting the very high performance achieved by this model. Tried in alternation with the original GS1000 (we bought the review sample and have hundreds of hours experience with it), it clearly maintains the general sound character. Tonal neutrality is excellent from lowest bass to highest treble and detail is superb. And as with all the highest quality headphones, one is aware from the first few seconds of music that the resolution is in a different league from most loudspeakers, showing up musical details (and occasionally blemishes too) that had simply not registered before. As for differences from the non-'i' GS1000, we had to listen for quite a while before we were really sure that we heard any at all. Despite Grado's claims, we couldn't convince ourselves that the treble was significantly changed, but the bass is indeed a touch more secure and indeed is a particular glory of the model; very extended but always clear and tuneful. The midrange seems to us just slightly more present and vocals are as a result slightly more clearly differentiated from instrumental accompaniment, for instance. But this is nit-picking, as overall the character seems largely unchanged. Comparing this model with the HD800, we'd have to say we felt the latter to have the edge in both tonal neutrality and detail. On the other hand, the Grado is, perhaps, a little more lively dynamically and that alone will make it the obvious choice for many listeners. It has endless rhythmic vivacity and that, combined with the high resolution, makes it without a doubt one of the most convincing bits of audio kit we know. 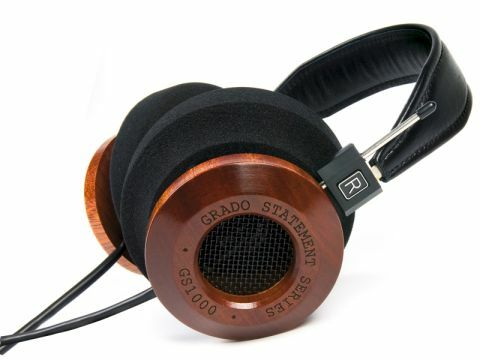 We've also learned that Grado has a new 'professional' model, the PS1000, placed above the GS1000i. Although considerably dearer, it could be the new point of reference. Watch this space.